The effect of global warming on glaciers of Nepal has serious implications for the fresh water reserve. Increase in temperature and precipitation in Himalayas accelerates the process of snow melting as well as enhances flooding event from direct runoff whereas dry season discharge is decreased. The major concern is rapid reduction of glaciers in much of the Himalayan region and shifting upwards of snow line. Very few literatures are available on snowmelt runoff modeling. This book summaries research design and the SRM model and the required data for run this model. It gives the detail outline of temperature index i.e. Positive Degree Day, PDD models, Snow Melt Runoff, SRM simulation and climate change assessment procedures and data preparation for model run. It deals about the data acquisition, its pre-processing and the post-processing such as to make them ready for the input to the simulation model. 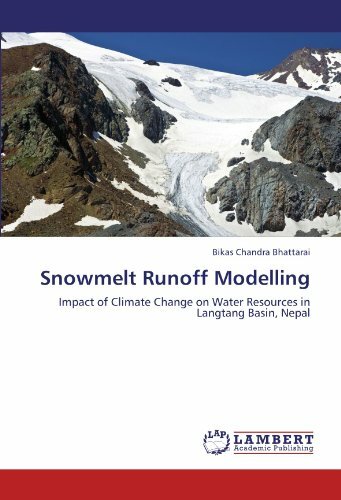 This book can be useful for the researchers who are interested to investigate the contribution of snow melt in stream flow of snow-fed stream and impact of climate change on water resources. Bikas Chandra Bhattarai, Master in Environmental Science from Central Department of Environmental Science, Tribhuvan University, Nepal having half dozen of academic research in different environmental and social issues like Landslide hazard mapping, climate change, permafrost, snowmelt runoff modeling, water quality analysis, child labour etc.